The Sea Rescue Station of Arriluze is located in the town of Getxo, on an old port from which it received its name, and very close to important touristic spots like Ereaga beach and the 'Getxo Kaia' marina. 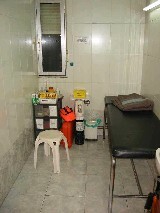 The station has a complete first aid room in order to give response to all kind of accidents that could happen on the site due to the massive crowd attracted by this area, specially during summer. Despite of its reduced size, it has been prepared to assist an average of 1000 cures per year accounted here. The room is equipped with all kind of materials to treat minor accidents (from simple bandages to collars, splints or a spinal board) as well as for more serious problems requiring oxygen, resuscitation or defibrillation equipment. But the big task of our station remains on the Sea Rescue, and this is what it was originally built for. The Emergency Coordination Center is a room conceived to receive the emergency calls (either by phone � 94.4.600.200 � or by the call & distress frequency of the sea band radio � Channel 16 V.H.F. � ) and to co-ordinate the resources in action on its response. For this purpose we have two VHF radios on the sea band, one of them permanently listening on channels 16 and 10 (international call & distress and Bilbao Traffic frequencies) and the other one for internal communications with our lifeboats. We also use a mobile phone system on rivers and inner waters, where radios are out of range. In addition, in this room there is also a radio used to communicate with our vehicles for support from land including the ambulances of the Red Cross, as well as another one to contact Civil Protection of Getxo (co-ordination with local police and ambulances of DYA). This is the place from where all the emergencies are monitored and from which the lifeboats are directed to the distress areas, by giving them precise details about the area extracted from navigation charts, official Pilot charts, and index cards prepared by the volunteers describing the coast and its dangers. There is also a big garage-storage room where all the equipment that could be needed by our crews is kept. 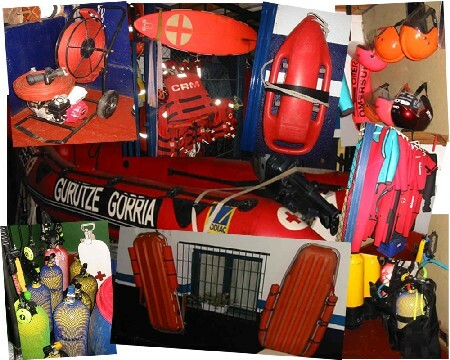 Here we can find things like thermal suits, life vests, neoprene diving suits, complete diving equipment, blankets, knifes, ropes, fire fighting equipment (all kind of extinguishers, water pumps and hoses...), including the sanitary equipment employed at sea (collars, pneumatic splints, spinal board, nest stretchers, medical kits, rescue cans, rescue board...).